Practise your spanish at home by clicking on the link below. Once the link is open please click on the audio icon by the spanish word to hear the word. I have created a Wallwisher wall. It is a simple webpage where we all can post all your synonyms for good. Remember this is similar to the work you undertook to create word banks in Literary during the poetry unit. This week in Topic we spent time designing and making our printing blocks. Children made the stamps based on work we did on Adinkra symbols. The stamps have a variety of different meanings. In your comments please explain the meaning of your stamp. After half term we will be learning to tie dye and use the printing blocks. This will when help us create our Rainbow Fabric. Click on the stripy box and have a go at writing your own list sentence. 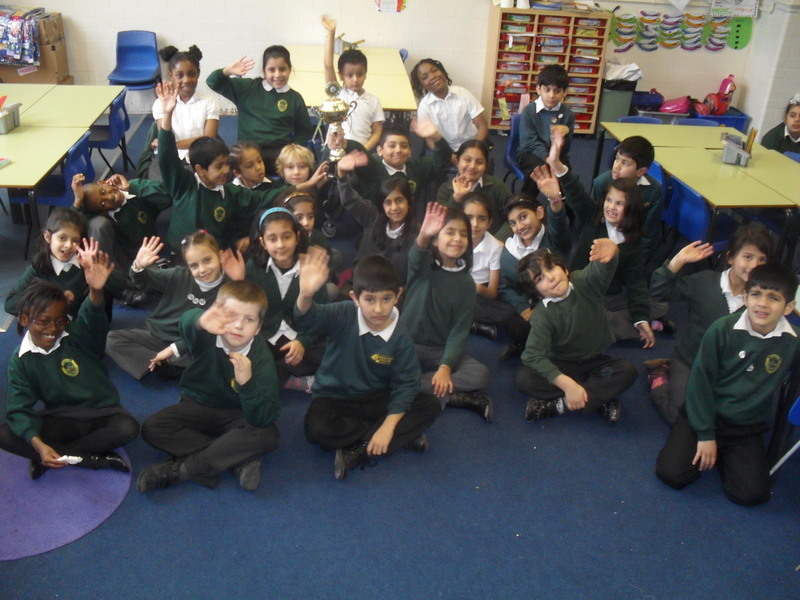 Year 3 are the very proud winners of the Lunchtime Award for the SECOND week in a row! We won the award for our good behaviour and manners but it was a closely run race! Keep up the good work everyone! Here we are celebrating with our shiny trophy! This week in Numeracy we are going to make a Bearwood Bus Route for the class. In oder to complete this task we went on a walk around Bearwood and took photographs of where we see time. We also looked at the different bus routes and times. In addition to this we took stop clocks and measured the walking time between each bus stop. Literacy – This week we have been reading myths sets in Ancient Greece. We have learnt about some Gods but can you learn about Zeus, Athena and Poseidon. Furthermore, can you research Pegasus? What was special about Pegasus? Numeracy – “Oh no! I have missed the bus. I wonder how long the next one will be?” Next week we are going to be learning time but we are going to make our own Bearwood Bus route and timetable. Practise telling the time using analogue and digital clocks this weekend. If you go anywhere record how long it takes you to get there. 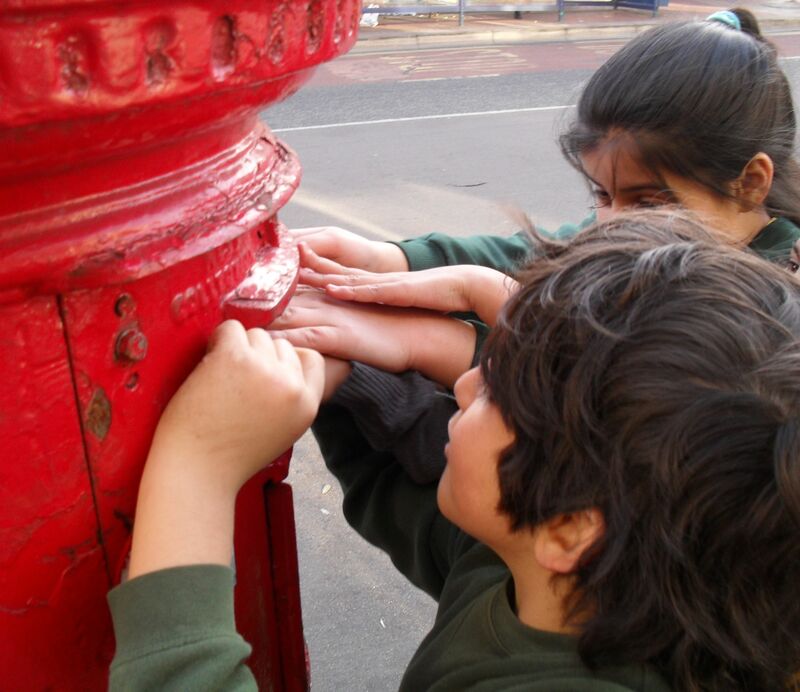 On Monday we are going on a walk around Bearwood to look at how time is used and learn about bus timestables. This weekend set yourself three goals to achieve. Talk to someone about your goals and how you are going to achieve them. On Sunday think about whether you achieved them or not. Remember one of your goals could be to do your Get Talking Get Learning! In topic next week we are going to be learning about Adinkra symbols and how they represent inner qualities. Talk to someone about your inner qualities. Do you want to add anymore inner qualities? Can you describe the inner qualities of someone at home? We are going to be designing our own modern day Adinkra symbols. Think about your inner qualities and what symbols you could use to represent them for example a heart could show you are a very loving person. Today we got to work with a real life artist called Natalie Gore. Natalie showed us the new design for the school gates. It is based on storybooks and book characters. The children had to make a stencil ready to be cut on a metal cutting machine. We would like to express our thanks to Natalie for a brilliant day! We had great fun planting Willow at Calthorpe Haven. Competition for George at Asda! Recently, Mrs Daniels received an email about a competition to design a new outfit for the George at Asda clothing range. The children designed their own outfit and in Writer’s Workshop they wrote their descriptive information about their outfit. We collected them altogether ready to post them. Nathan went to the school office and he learnt how to put postage on the school mail. 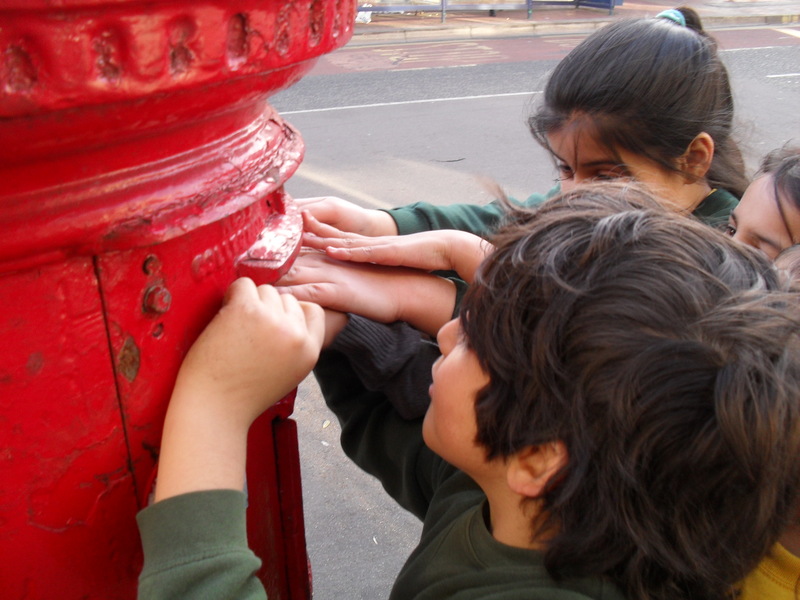 Yesterday on the way back from Calthorpe Haven Miss Thomas took a small group of children to the post box to post our mail. We are looking forward to Asda’s response!